Hey there! Happy Tuesday! We are currently on a Winter Storm Warning... It sound exciting but it is not. I am really excited....NOT! I am all about a "White Christmas"... But lets get through this week first... My little miss gets Student of the Month today! She has not a single clue. I can't wait to see her face and share pictures with you all! This weeks challenge we are stepping away from the holiday themes! You can thank me later...WAIT! The theme this week is "Thank You"... I can't wait to show you what I made using goodies from the Stampin' Up! Sale A Bration Catalog and 2016 Occasions Catalog that will be available to the public January 5th, 2016! When I started this card I knew I wanted to use the new It's My Party DSP! This stack has 48 double sided sheets of some really great patterns and not all are birthday themed. The base of the card is Mint Macaron and with a matte of Sahara Sand to coordinate with the DSP. I fastened my twist of Bakers Twine in Mint Macaron and Black around the sheet of DSP before adhering it to the Sahara Sand Card Stock. The sentiment "Just For You" is from a set out of the Sale-A-Bration catalog which means you can earn this for FREE by spending $50 dollars! The set is called Botanicals For You and I LOVE this sentiment! I took a piece of Basic Black scrap card stock using Versamark ink and stamped the sentiment. I then used our Stampin' Emboss White powder and used our Heat Tool. Once that was done I used our largest Banner Framelit to cut this in my Big Shot on the Sizzix Magnetic Base. 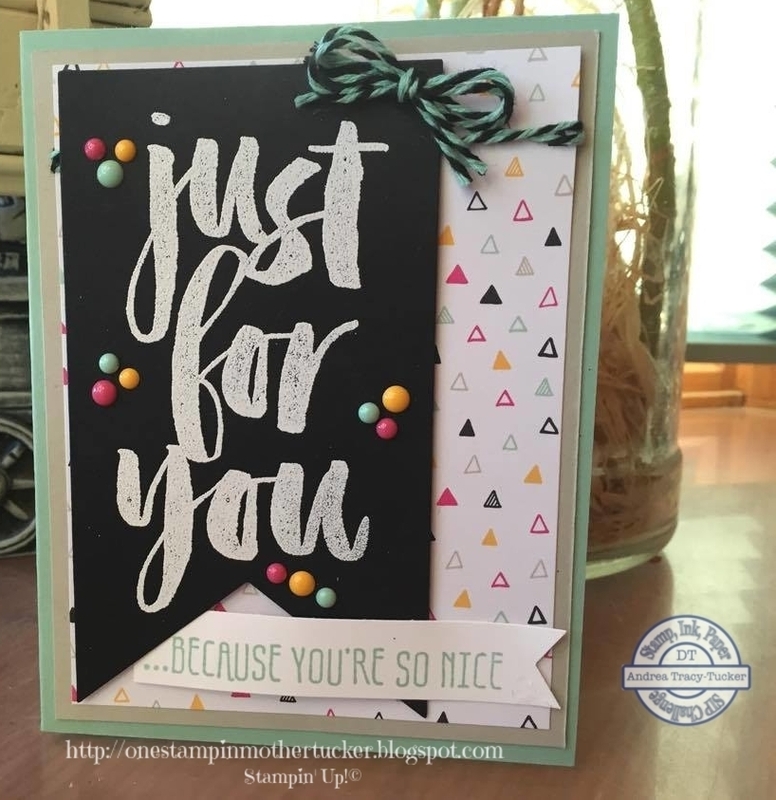 I then went wild with the It's My Party enamel dots , added the twine bow and adhered it to my DSP with Stampin' Dimensionals. "...Because you're so nice" is also from the Botanicals For you and was my final touch to this card. I stamped this in Mint Macaron ink on Whisper White card stock and then used our Banner Triple Punch to do the end. I used a couple mini glue dots to fasten it.... Boom!!! Done!!! Can't wait to see your "Thank You's! Cheryl!! Thank You so much stopping by! So pretty Andrea! I love the gorgeous colors and the big sentiment.